While the presence of footballers of African descent have been evidenced from the late 1800s in British football with the well documented stories of Arthur Wharton and Walter Tull (probably the most well-known of these), it is comparatively recently that players of African descent represented Hull City. Hull City was founded in 1904 although there is no evidence of any players of Black African/Caribbean heritage that played for the club until the 1980s. However, there is evidence of a South African, George Wienand who represented the club even before the outbreak of World War Two. During the 1950s a further three South African-born players went on to play for Hull City, Norman Nielsen, Neil Cubie and most well known of all, Alf Ackerman. The decade also marked the first appearance of a footballer of Black Caribbean heritage who played against Hull City in 1955. The first known appearance of a player of Black African/Caribbean heritage was the famous entertainer Charlie Williams who was a professional footballer with Doncaster Rovers before going on to forge a highly successful career as a comedian and entertainer. 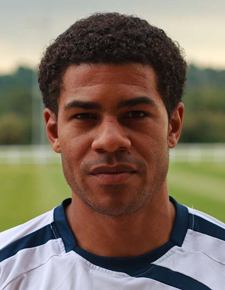 Williams featured in the corresponding fixture the following season but on that occasion the programme notes made no reference to his “colour”. Given the evidence of players of African/Caribbean descent playing against Hull City from 1955 and the gradual increase in the numbers of players from such backgrounds from the 1960s onwards it may seem somewhat surprising that the first player to represent the club itself didn’t do so until 1986. Ray Daniel was born in Luton in 1964 and played for his home town club between 1981 and 1985. Brian Horton, the Hull City manager at the time, was a former Luton Town player and signed Daniel to play as either a left back of left sided midfield player. He made his debut in the 1986-7 season and went on to make a total of 57 appearances for Hull City scoring 3 goals. 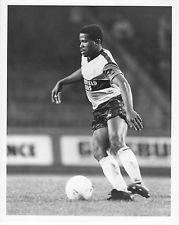 Charlie Palmer was born in Aylesbury in 1963 and after an initial career that saw him play for Watford and Derby County he signed for Hull City in February 1987 for £32,000. An attack-minded right full-back he made his debut in the 5th Round of the FA Cup away at Wigan Athletic, a game that City lost 3-0. 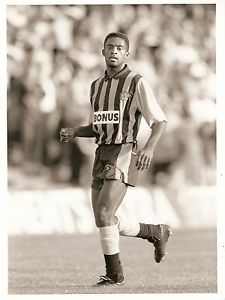 Between 1987 and 1989 he played a total of 77 games for the club scoring one goal before leaving to join Notts County. Alexander Constantine “Alex” Dyer was born in Forest Gate, London on 14 November 1965. After playing for Blackpool he joined Hull City at the same time as Charlie Palmer and also made his debut in the ill-fated FA Cup tie at Wigan Athletic in the 1986-7 season. He initially played as a left-winger but enjoyed more success in a traditional centre forward role. He is probably best remembered for scoring a spectacular goal in a 2-0 win away at Leeds United in the 1987-8 season. In total he played 67 times for Hull City scoring 18 goals. Tony Finnegan was born on 17 October 1962 in Wimbledon and after initially playing for Crystal Palace he joined Hull City in the 1990-1 season signed by the then manager Stan Ternent. 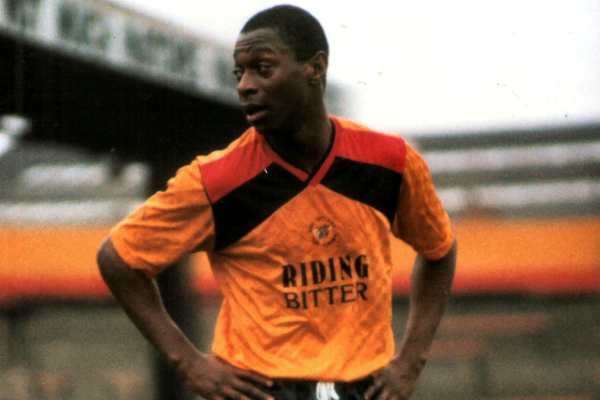 He played only 17 games in midfield for Hull City during the 1990-1 season scoring 1 goal. A right back who joined on loan from Stoke City and played 7 games during the 1994-5 season. Gavin Gordon was born in Manchester on 24 June 1979 and joined Hull City playing for their junior team. After excelling at that level he was rewarded with a professional contract and became the second youngest player ever to play for Hull City. He was sold to Lincoln City for £30,000 early in 1997-98 by Mark Hateley. After consistent goal scoring at Lincoln City he signed for Cardiff City for £550,000 fee although he had to give up his right to play for Jamaica in order to sign. He later went on to play for Notts County. He played 24 games for Hull City between 1995-6 and 1997-8 and scored 10 goals. David Rocastle was born on 2 May 1967 in Lewisham and had a glittering career playing for Arsenal, Manchester City, Leeds United and Chelsea in the First Division before signing for Hull City on loan during the 1997-8 season whilst Mark Hateley was the manager. Although only going on to play 11 games for the club scoring 1 goal the former England international Rocastle generated huge interest in the city. Tragically, Rocastle was diagnosed with cancer in February 2001 and after a short illness died on 31st March 2001 at the age of 33. Lee Ellington was born in Bradford on 3 June 1980 and joined Hull City as a junior player. After impressing as a fast paced forward he made his debut for Hull City’s first team at the age of just 16. He made a total of 8 full appearances scoring 2 goals before leaving to join Exeter City in 1999.